Drunk, I stumble out of a back street bar and walk through Na Trang along railroad tracks until I sober up. In many ways, it is the most incredible walk of my life. I produce some of the richest images I'll ever capture, and most of those on a single roll of film. At first I hike with two fellow Navy photographers, but eventually I find myself alone and lost in a maze of city back streets. I meet an American who wears Vietnamese clothes and refuses to speak English. His friends block my camera when I try to photograph him. I meet and photograph dozens of locals and develop a dynamic connection with the people. Eventually some American women who are USO workers rescue me and get me safely back to the men in my unit. 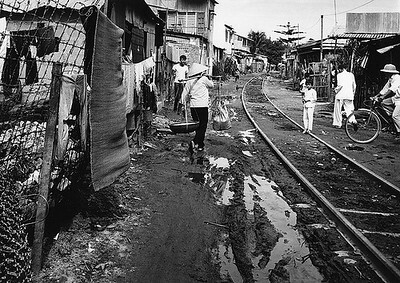 So I walk these tracks for miles through the back alley of Na Trang in 1969. In many ways, I walk that path to this day.